60% nuts. High fibre. Ingredients you can see & pronounce. Gluten and dairy free. No artificial colours, flavours or preservatives. Kosher.Do the kind thing for your body, your taste buds & your world? Here at Kind, we make delicious and nutritious snacks using the finest ingredients. 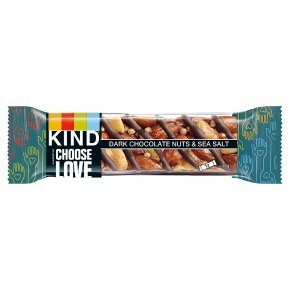 Dark Chocolate Nuts & Sea Salt includes a sweet and salty blend of almonds, peanuts and a sprinkle of sea salt, bound together with a touch of honey and drizzled in chocolate. Our Nuts & Spices bars have 40% less sugar per 100g than similar snack bars.